We recently received a question from a reader about serving coffee on tap. Do you recommend CO2 or Nitrogen for serving coffee on tap? And will CO2 make it fizzy? Both were great questions so I figured why not dedicate a full post to this topic, but before answering the question, lets give a little background on the two gasses. Carbon Dioxide (CO2) is the gas used to carbonate beers, sodas, sparkling waters. CO2 is a naturally occurring gas (it is actually produced during the fermentation process) and it is highly soluble, meaning it is easily absorbed by liquids such as beer, soda, water, etc. Nitrogen (N) is another naturally occurring gas, however it is far less soluble than CO2. Nitrogen is used to serve beers under high pressures, like Guinness. Beers served with Nitrogen are actually carbonated with CO2, however, when they are served, they are forced through a “restrictor” which causes the thick, frothy head that you’re familiar with on beers like Guinness and Bodingtons. A beer gas blend of 70-75% N / 25-30% CO2 will be used to pressurize and serve beers like Guinness. Since Guinness needs to be served at a high pressure, keeping the keg pressurized with only CO2 would quickly over-carbonate the beer. The blended gas prevents this. Now, after that long aside about gasses, lets get back to the question at hand. Serving coffee on draft and what type of gas is recommended. So which gas is recommended for serving coffee on tap? Firstly, lets keep in mind that when dealing with coffee, we are not trying to carbonate it. We are only using the keg and the tap as a delivery system. As a result, we will not need a very high pressure to serve the coffee – only 3-6psi. So to answer the question: Will CO2 make it fizzy? Any liquid that remains under pressure from CO2 for too long will eventually begin to carbonate. The higher the pressure, the faster CO2 will be absorbed by the liquid. The lower the pressure, the longer it will take the liquid to absorb CO2 (carbonate). That being said, CO2 is highly soluble and WILL begin to dissolve into the liquid. Which leads us to Nitrogen (N). Nitrogen is the preferred method for serving coffee on draft. 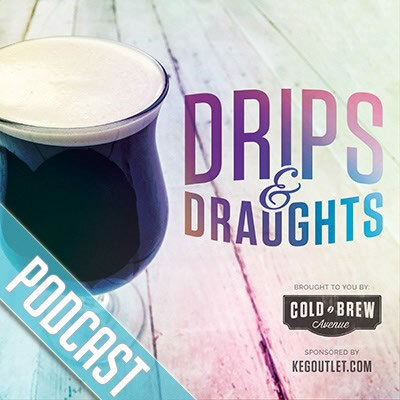 Nitrogen is typically used at high pressures with a special tap for serving beer, but when serving coffee, we don’t need the high pressure because we’re not looking for a frothy head like you’d see on a Guinness Stout. When serving coffee on tap, using Nitrogen at low pressure will allow your coffee to remain as it was brewed. 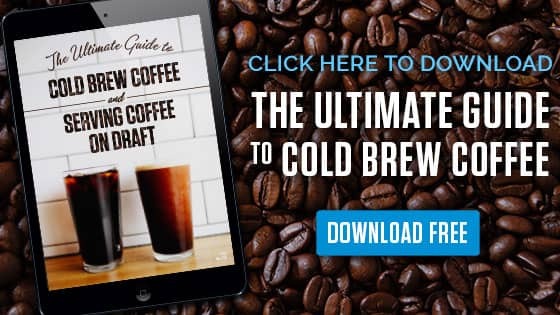 Either way, one thing to keep in mind will be that hot brewed coffee will always change in flavor after it cools, where as cold brewed coffee will remain stable and fresh tasting for much longer.